To make the crust: Process the cookies with the salt until you’re left with fine crumbs (about 20 seconds), then add the melted butter and pulse about 10 times, just until incorporated. Using your fingers or the back of a spoon, begin by pressing the mixture into the bottom of the pie pan and part way up the sides. To keep the crumbs from sticking to your fingers, it helps to place a piece of plastic wrap over the crumbs and press them through the wrap. Be sure to press the bottom thoroughly so that the crumbs are evenly distributed. To make the crumble: Combine flour, sugars, crushed gingersnaps, ginger and salt in a food processor. Pulse for a few seconds to incorporate. Add butter and pulse again until the mixture resembles pea-sized crumbs, then set aside. To make the filling: Preheat the oven to 350F (or 325F if using a pyrex pie plate). Process the persimmon puree with the milk, brown, sugar and egg for about 8 seconds or until smooth. In a small bowl, whisk together the flour, baking soda, cinnamon, nutmeg and salt. Add this to the food processor and pulse about 8 times or until incorporated. Add the butter and pulse about 4 imes or until incorporated. Add the chopped persimmon, walnuts, candied ginger and pulse twice, just to incorporate. (You’ll have bout 3 1/2 cups of filling). Immediately pour the filling into the prepared pie crust (the acidity in the persimmon reacting with baking soda will cause the mixture to stiffen quickly.) The filling will reach almost to the top. Smooth the surface and sprinkle the crumble over the top. 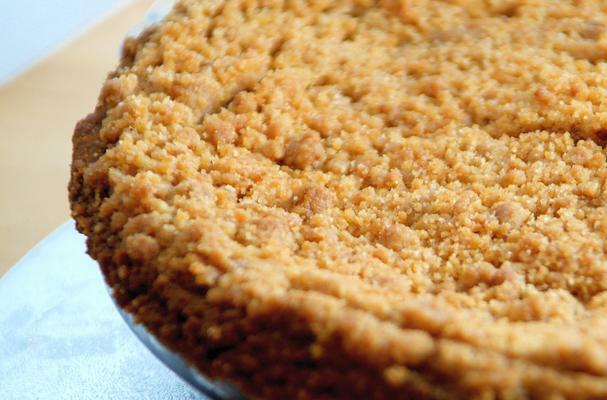 Now, I’m sure many of you savvy bakers, persimmon afficianados and gingersnap munchers are probably thinking – "Gingersnap crust AND ginger crumble topping? Are you mad? That subtle persimmon flavour will melt under so much heat!" And you’re right. Melt it did – into a creamy, spicy fruit layer which may have smacked more of ginger than persimmon, true, but it worked. Oddly, my taster described the fruit filling as “chocolatey”, which made little sense to me – it tasted nothing like chocolate – but maybe he was referring to the smooth, silky texture.. (Plus, I can count the number of times I’ve seen him eat chocolate on one hand.. so there you go.) Anyway, this sweet & spicy pie is the perfect treat to warm things up on a cold winter's eve - give it a try as written if you love ginger or try dialing down the heat by leaving out the candied ginger in the filling (and even using a different crumble topping if you like). Enjoy!